Just one year after its debut, the Cadillac ATS lineup adds a 2-door coupe, and all ATS models have a new grille design with a wreath-less Cadillac crest in the center. The popular turbocharged 4-cylinder engine makes more torque, while the controversial CUE infotainment system gains the following upgrades: Text Message Alerts, Siri Eyes Free, OnStar 4G LTE connectivity, Cadillac DockSpot wireless device charging, Teen Driver settings. A passive entry and push-button starting system is standard for 2015, and new options include premium leather upholstery, suede microfiber seat inserts, a power tilt/telescopic steering wheel, automatic safety belt tightening, and Lane Keep Assist. A new Safety and Security Package is available, interior color combinations are revised, and two new exterior colors also debut. 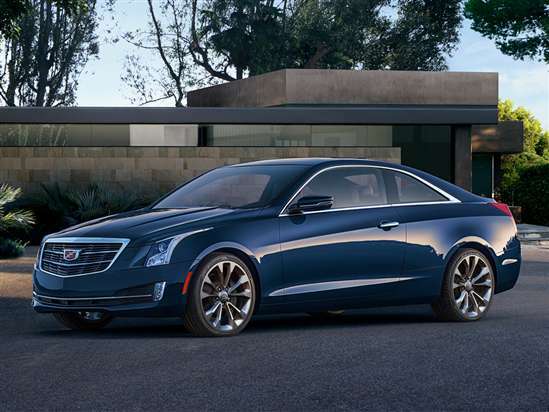 Cadillac offers the 2015 ATS as a coupe or sedan equipped with Standard, Luxury, Performance, or Premium trim. The new ATS coupe shares its wheelbase with the sedan, but its bodywork is unique and its track is wider. Plus, coupes come standard with a turbocharged 4-cylinder engine, performance brakes, 18-inch aluminum wheels, and Luxury trim. A 202-horsepower, 2.5-liter 4-cylinder engine is offered only for the ATS sedan, and only in Standard or Luxury trim. A 6-speed automatic with manual shift control powers the rear wheels. Most ATS models have a turbocharged 2.0-liter 4-cylinder engine making 272 horsepower and 295 lb.-ft. torque, with at least 90 percent of the torque on tap from 2,100 rpm to 4,600 rpm. This engine is paired with a 6-speed manual gearbox or 6-speed automatic transmission, and is available with optional all-wheel drive. The ATS coupe and sedan can also be optioned with a 3.6-liter V-6 good for 321 horsepower and 275 lb.-ft. of torque. A 6-speed automatic transmission is standard, and AWD is optional. Depending on the engine, transmission, and drivetrain, the 2015 Cadillac ATS returns between 21 mpg and 26 mpg in combined driving, according to the EPA. In addition to eight standard airbags, the 2015 ATS features OnStar services with one free year of Automatic Crash Response, which helps speed rescuers to the scene of any accident in which the car’s airbags have deployed. In crash tests conducted by the NHTSA, the ATS sedan earns a 5-star frontal impact and a 5-star rollover resistance rating. No other crash tests had been conducted on this car as this summary was written. New for 2015, the ATS features DockSpot technology that wirelessly charges devices placed on an inductive charging pad. Additionally, the ATS gains 4G LTE connectivity this year, transforming the ATS into a mobile Wi-Fi hotspot.